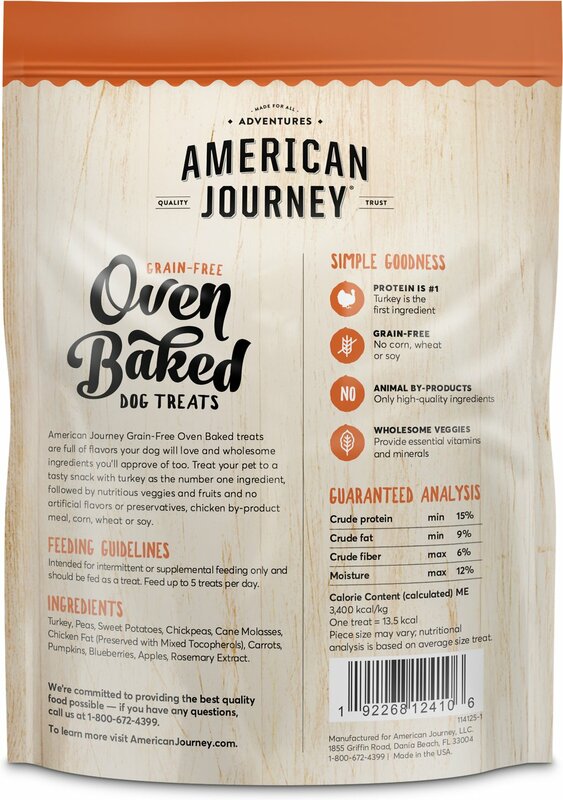 American Journey Turkey Recipe Grain-Free Oven Baked Crunchy Biscuit Dog Treats are grain-free, crunchy snacks sure to please your pup whether you’re both on the go or right at home. Small but full of flavor, these bite-size treats are made with wholesome ingredients that will keep your pup energized for any daily adventure ahead. Every bite is packed with the crispy crunch that could only come from a treat that’s perfectly baked right in the oven! Real, high-quality turkey comes first, followed by tasty veggies and fruits, including sweet potatoes, carrots, pumpkins, blueberries and apples. And these naturally preserved, filler-free treats are also free of poultry by-product meal and artificial colors, flavors and preservatives. Treat your dog to quality and taste with American Journey Grain-Free Oven Baked Treats. Protein-rich dog treats with real turkey as the number one ingredient for a taste your dog will love. Oven baked so they pack a satisfyingly crunchy, crispy texture that dogs crave, in every bite. 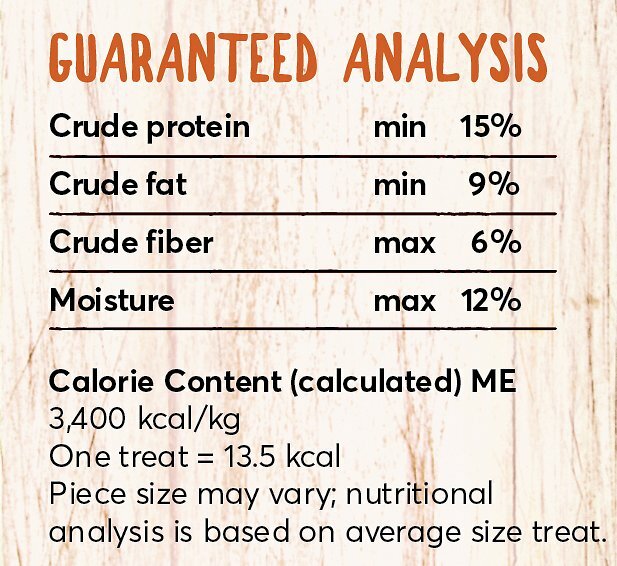 Grain-free dog treats that are also free of fillers like corn, wheat and soy. Made without any poultry by-product meal, artificial colors, flavors or preservatives. Wholesome veggies and fruits—like sweet potatoes, carrots, pumpkins, blueberries and apples—round out this tasty dog treat. 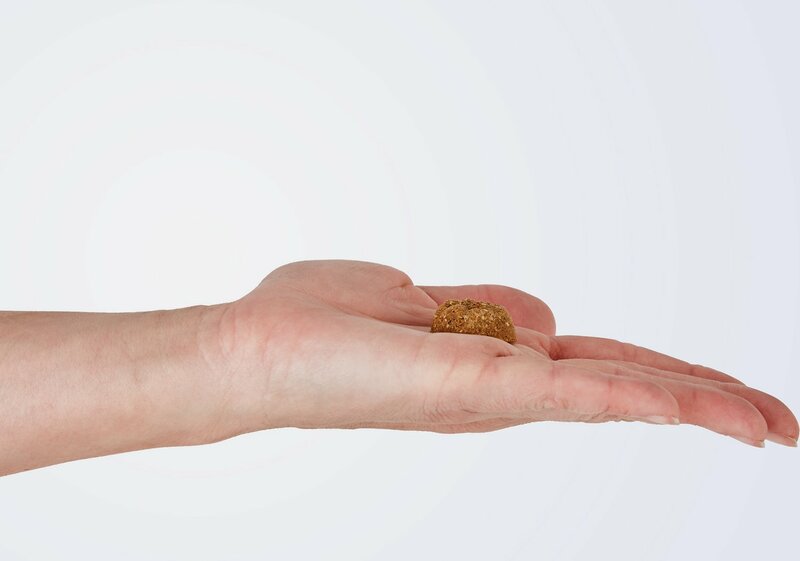 Portable and small enough to fit in your pocket, these bite-size dog treats are perfect for on-the-go or anytime treating. Turkey, Peas, Sweet Potatoes, Chickpeas, Cane Molasses, Chicken Fat (Preserved with Mixed Tocopherols), Carrots, Pumpkins, Apples, Blueberries, Rosemary Extract. Intended for intermittent or supplemental feeding only, and should be fed as a treat. Feed up to 1 - 5 treats per day. 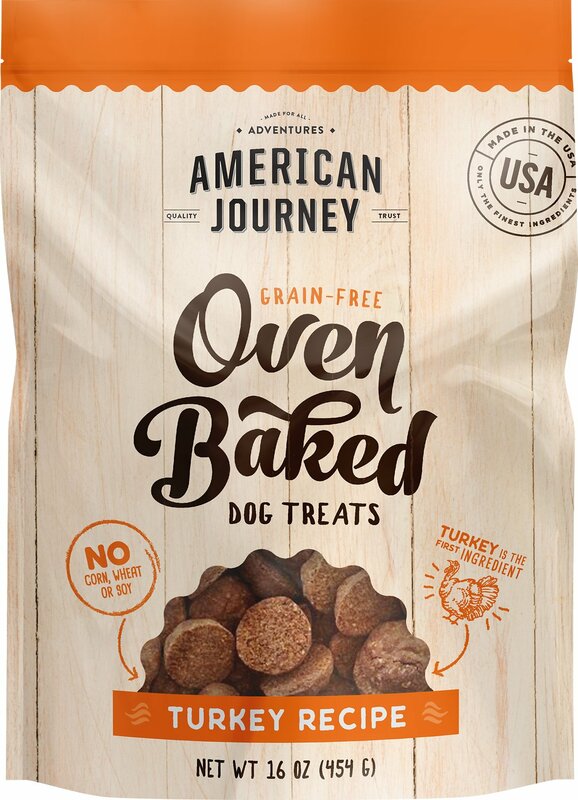 American Journey Grain-Free Oven Baked Dog Treats are made with the crunchy, crispy texture dogs love and flavorful options like real poultry, fish or red meat, and delicious peanut butter—with never any grains. Every bite packs a satisfying crunch and the goodness of wholesome ingredients like turkey, chicken, lamb, salmon, chickpeas, fruits and veggies, baked right in. No matter where you go with your dog—hiking, visiting a dog park, strolling around the neighborhood or learning tricks in the living room—you want to have a supply of tasty treats on hand. American Journey Oven Baked Treats are bite-size, so they fit perfectly in your pocket or treat pouch. They're made with wholesome ingredients like nutritious chickpeas, real meat, real peanut butter and healthy fruits and veggies that deliver antioxidants, beta-carotene, dietary fiber and many different vitamins. These flavorful treats are oven baked and make the perfect midday snack in between meals. They've got the right amount of crunch, and are just the right size for any pup to enjoy. There are some things you won't find in American Journey Oven Baked Treats, and those are grains and fillers like corn, wheat or soy. They're naturally preserved and free of by-products, poultry by-product meal and artificial colors, flavors or preservatives. At American Journey, we know any day can be filled with adventure. That's why from treats to dry and wet food for dogs and cats, we craft recipes to fuel everyday adventures—wherever they may take you. We always start with real, deboned protein plus nutrient-dense fruits and veggies, and manufacture our products right here in the USA, using domestic and globally-sourced ingredients from trusted suppliers. Available exclusively at Chewy.com and PetSmart. I was disappointed in these treats. I thought from the pictures that they would be smaller, much smaller. I like to give my dog treats when I'm training with him. These are not useful for that at all. In the picture it shows them in someone's hand. They are way bigger than the picture led me to believe. I do give them to my dog when I put him in his crate. He takes it in his mouth and just looks at me as if to say, what is this big thing?? I received this and the light up ball on the same day. The food I get from you is good, but so far the other items have been a big disappointment. We call them "Princess Cookies"
Eh some like em some don't. My German Shepherd and Pitt mix take the treat and look at it and sniff it for a few minutes first before eating these. It is almost as if they are waiting for something better. My fat chihuahua loves them tho and will run behind the others and scoop them up if they aren't quick enough. I have a 19 lb beagle chihuahua mix and his teeth are small and deep in the back of his mouth making brushing that area nearly impossible. I have tried all types of hard biscuits to keep the tartar off the back teeth. He refused them all except this American Journey brand. He gets one a day and his teeth never looked cleaner. I tried all the varieties of these American Journey treats. My dog also loved the peanut butter and chicken treats. They fit the ends of a chew toy which provides a thinking activity. Will definitely continue to purchase. My dog seemed to really like these biscuits. Of course they leave crumbs since its not a chewy treat so I'm not a happy pet parent because she likes to take the treats and eat them on the bed but that's a personal problem, haha. My dog really does love these treats and you get a lot of them if you order the bigger size bag. PLUS BUY ONE GET ONE FREE HELLLO WHAT A DEAL! My dogs really liked these once they got over how hard they are and that they need to take their time chewing. My small dog needs it to be broken in fourths to easily chew. Two paws up from Buddy! I have an unfenced yard and sometimes my dog likes to "wander" to explore other areas of my neighborhood. I now keep a bag of the oven baked treats by the door. When he gets that look in his eye, I just shake the bag, and he usually comes running. We originally purchased these treats due to the coupon provided with an order but we will purchase again. Finally, a crunchy treat which doesn't make a mess & our dogs love. I appreciate the ingredients also. I first tried these treats a few months ago and my babies love them!! I am so happy to find a treat all three will eat!! They are extremely picky eaters.